With over 30 years playing guitar with various types of bands, I developed a solo act, playing 6-string and 12-string acoustic guitar and singing popular and familiar songs from the 60's through today, with the occasional original tune, obscure cult hit or crowd favorite. For those of you needing something on the spiritual side, I also have a repertoire of contemporary Christian songs. I travel light with my amp, guitar and mic/stand, can set-up/take-down quickly and just need a corner in which to sit and entertain your patrons. Reference: Contact Pat Collins, Jr. at Shady's Tavern in Brooklyn. I play and sing classic, popular acoustic-driven, folk, pop (and a little country) cover tunes from the 60's through today, as well as a few of my original songs. 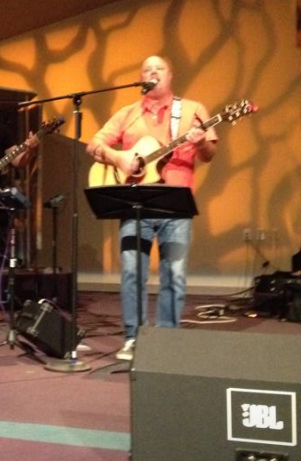 For church events, I do have a full repertoire of familiar contemporary Christian songs and some original worship tunes. Popular songs are from familiar artists including Simon & Garfunkel, Johnny Cash, Jimmy Buffet, The Beatles, Alan Jackson, Bon Jovi, Jim Croce, The Eagles, Billy Joel, Elvis Presley, Green Day, Bruce Springsteen, James Taylor, and other popular artists. I travel with a portable 30W, 2-channel acoustic amplifier with separate microphone and guitar inputs, microphone stand, microphone and cords. I typically don't carry staging, lighting or other A/V equipment, however, I can bring lighting if required.